(012.02) C/SP 16 09 on KE7 3d (SG.104), rounded corner perf. 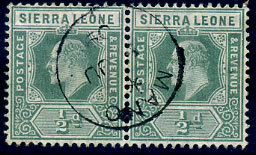 Illustrated Page 6 of "The Postmarks of Sierra Leone 1854-1961 Second Edition" by Walton, Quirk, Hamilton, Horry. (109.03) */AP 25 29 on KGV 1d (SG.132) fragment. 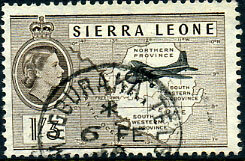 Illustrated Page 69 of "The Postmarks of Sierra Leone 1854-1961 Second Edition" by Walton, Quirk, Hamilton, Horry. (106.01) */1 JU 09 on horiz. 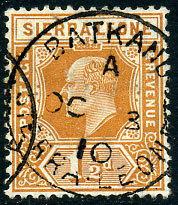 pair KE7 ½d (SG.99), exceptionally rare. 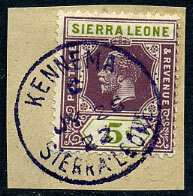 Illustrated Page 67 of "The Postmarks of Sierra Leone 1854-1961 Second Edition" by Walton, Quirk, Hamilton, Horry. (025.03) */DE 2 13 on KGV 2½d (SG.116). 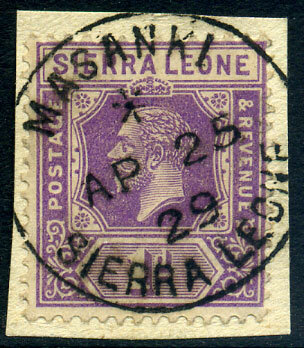 Very scarce early period as office closed SP 1 1915 to MR 15 1926. 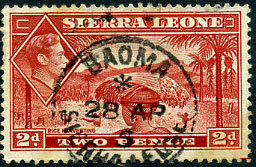 Illustrated Page 14 of "The Postmarks of Sierra Leone 1854-1961 Second Edition" by Walton, Quirk, Hamilton, Horry. (075.04) 10 NO 56 on QE2 1/3d (SG.218) piece. 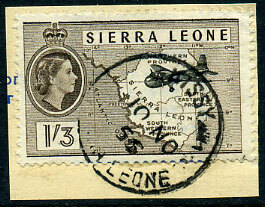 Illustrated Page 54 of "The Postmarks of Sierra Leone 1854-1961 Second Edition" by Walton, Quirk, Hamilton, Horry. 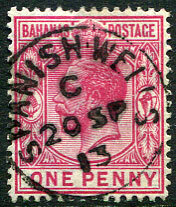 (036.02) sideways down C/15 DE 23 on KGV 3d (SG.136). 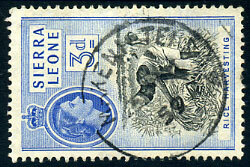 Illustrated Page 37 of "The Postmarks of Sierra Leone 1854-1961 Second Edition" by Walton, Quirk, Hamilton, Horry. (063.01) */15 JY 55 on KG6 2d (SG.191a). (030.02) */MR 11 13 on KGV 1d (SG.113). 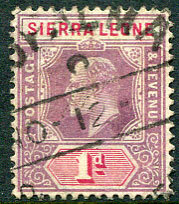 Illustrated Page 17 of "The Postmarks of Sierra Leone 1854-1961 Second Edition" by Walton, Quirk, Hamilton, Horry. 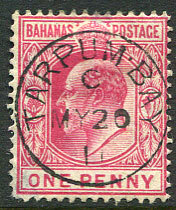 (008.01) */28 AP 5 (5 for year only) on KG6 2d (SG.191a), minor toning. (069.01) */JY 5 09 on KE7 ½d (SG.99). 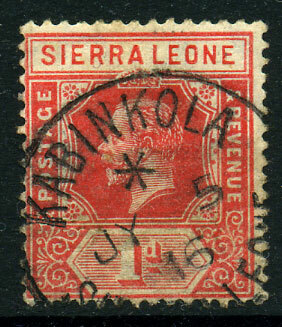 Illustrated Page 50 of "The Postmarks of Sierra Leone 1854-1961 Second Edition" by Walton, Quirk, Hamilton, Horry. 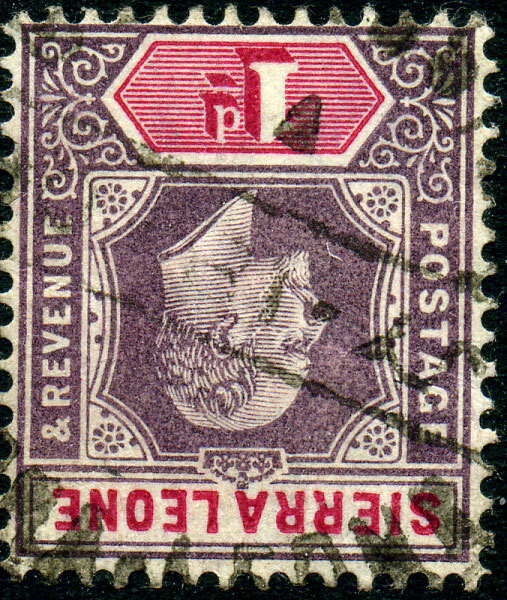 (018.03) C/OC 28 90 on QV 6d dull violet CC wmk (SG.35), oily lower left corner perfs. 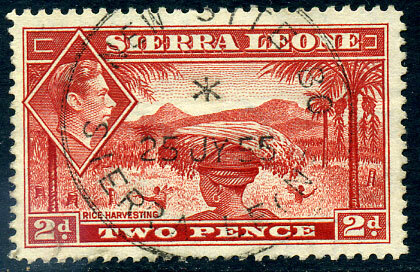 Illustrated Page 11 of "The Postmarks of Sierra Leone 1854-1961 Second Edition" by Walton, Quirk, Hamilton, Horry. 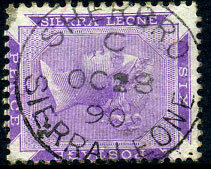 (072.01) in purple dated C/JY 26 22 on KGV 5d (SG.138). 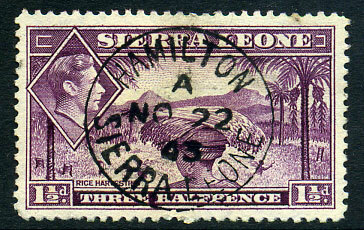 Illustrated Page 52 of "The Postmarks of Sierra Leone 1854-1961 Second Edition" by Walton, Quirk, Hamilton, Horry. (016.21) */25 JY 55 on KG6 2d (SG.191a). 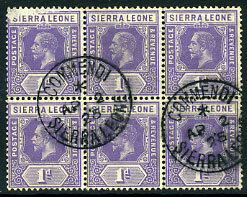 Illustrated Page 9 of "The Postmarks of Sierra Leone 1854-1961 Second Edition" by Walton, Quirk, Hamilton, Horry. (042.01) */8 JA 51 on KG6 1½d (SG.190a). 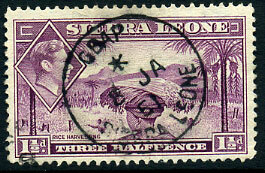 Illustrated Page 39 of "The Postmarks of Sierra Leone 1854-1961 Second Edition" by Walton, Quirk, Hamilton, Horry. 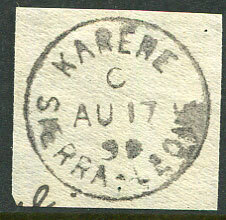 (058.01) dated */JY 5 16 on KGV 1d (SG.113a). Exceptionally rare office. 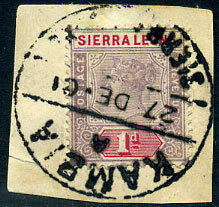 The few examples known being recorded period */MR 24 16 to */JY 5 17. 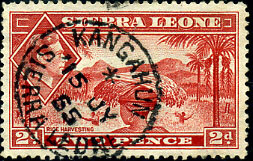 Illustrated Page 46 of "The Postmarks of Sierra Leone 1854-1961 Second Edition" by Walton, Quirk, Hamilton, Horry.